Magnetic attraction = better drumming? Slow-footed drummers, rejoice! 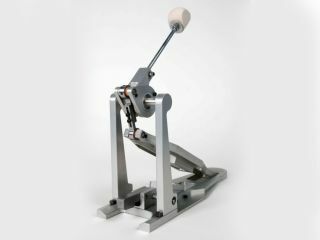 The Drumnetics Bass Pedal, a magnetically driven device, might be just the thing to step up your game. Through the use of magnetic repulsion instead of conventional spring applications, the Drumnetics Company, LCC brings you a new kind of bass pedal. Could it be the start of a revolution, or is it just another goofy fad? Time (and a MusicRadar review) will tell. Basically, the Drumnetics pedal works like this: at centreline of the pedal board and base configuration, two magnets allow the natural forces of repulsion to propel your foot upward each time you depress the pedal. Precision bearings in the internal mechanisms of the rotor cam allow for individual drummers to set custom beater angles and height adjustments. Depending on one's foot size and desired playing style, a slide adjust slot can be utilized to align the magnets. If it all sounds terribly complicated, the Drumnetics Co. promises an elegant transfer of energy, resulting in a pedal that offers smooth, rapid, and accurate action, with a minimum of fuss. In other words, you don't need a degree in physics to lay down some fat grooves with this baby. The Drumnetics Bass Pedal is currently available in a "standard finish" (a "two-tone" finish is in the works), and with a list price of $300 US, it's not exactly designed for the garage basher. But if you're a serious player who's looking for a high-grade, responsive unit, the "Drumnetic feel" might be worth a shot. In the coming weeks, MusicRadar is going to put its foot down and give you a full report.